Someone asked me what the hardest part of my career has been? I didn’t have to think twice: Learning to embrace criticism. Whenever we put ourselves in the public eye, even on a small scale, criticism flies at us. I once read a scathing criticism about Mother Teresa. Why would anyone ever criticize Mother Teresa? I would have never imagined 25 years ago when I published my first piece in Sports ‘N’ Spokes magazine about racing wheelchair technology that readers would send letters to the editor criticizing me. But, they did. I remember the next month’s issue where a Canadian racer lunched a personal attack on me in the Letters to the Editor section. It hurt and made me second guess myself, not as a writer, but as a person. Then I wrote a piece in New Mobility about the goal of equal rights for those with disabilities, and I again was shocked by the hate mail. By 1995, when my childhood autobiography was published – as wholesome as writing gets – I wasn’t surprised but disappointed at the strangers who didn’t attack the book, but me personally. With my work becoming so visible online since the late 1990s, and my career and public persona growing exponentially ever since, public ridicule and criticism is something I’ve faced on a daily basis for two decades now. It’s weird turning on your computer each day, seeing complete strangers hating you. But, it goes with the territory of being in the public light. 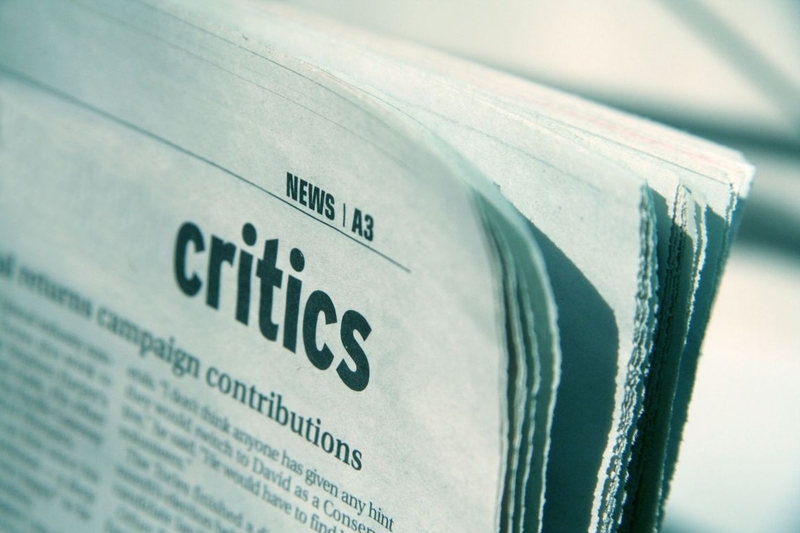 What’s intriguing about criticism, however, is that it’s by no means limited to those of us in public roles. In fact, among the most painful forms of criticism can come from those closest to us, those who profess to care about us – spouses, parents, siblings. I know because I’ve been there, too. I recently received an unsettling phone call from a 22-year-old college student with cerebral palsy. He’s striving to graduate college and build a life for himself, but his dad gives him no support, just criticism. I could relate on an eerie level because I was in almost his exact situation, where my estranged father went out of his way several times to lash out at me, mocking me for pursuing my education, criticizing me for “thinking I was better than everybody else because I was going to college.” Sure, it stung, but by that point I couldn’t put any credence in my father whose track record was a tenth-grade education, a walk-away father and an unemployed, life-long alcoholic. From Roosevelt to Brown, I wholeheartedly agree. We can’t put credence in armchair quarterbacks. If you’re on the field with me, taking blows, marred by dust and sweat and blood, I’ll give you due credibility. However, I can’t take beer-belly, armchair quarterbacks seriously – they invest nothing of themselves. If you criticize me, I will hear you out of decency, but I’ve learned that if I truly believe in what I’m doing – and I do – criticism may still feel lousy, but it doesn’t change my inspired path. Some are satisfied by watching and criticizing, but I’m busy doing. Let us live boldly in the arena, and as the seated critics shout – too cowardly to be in the arena taking blows with us – use it as validation that we’re doing everything right and getting stronger all the time, thriving on being marred in dust and sweat and blood. It takes nothing to be a critic; it takes everything to strive to make a difference. See, the ultimate strength isn’t in ignoring your critics; rather, the ultimate strength is in having the courage to continue moving your life and career forward regardless of what they say. I need to remind myself of this message often. Thanks for writing. That’s helpful to me too. Thank you, Mark.